Check out a close up of these beauties! You can see bits of cranberry right in them. These are a brilliant snack for the fall season! The combination of pumpkin and cranberry is wonderful and full of flavor. No need for any kind of dip with these flavorful, sprouted tortilla chips. Way Better Snacks simply sprouted tortilla chips are the first snack of its kind to incorporate sprouted ingredients like flaxseed, chia seeds, quinoa, black beans, broccoli seeds and daikon radish seeds. Featuring real cranberries and pumpkin, this new variety is a wholesome snack that’s also a tasteful toast to the season. Oh, My Sweet Punkin Cranberry tortilla chips are also Certified Gluten Free, Non-GMO Project Verified, Kosher, vegan, an excellent source of whole grains, and low sodium. Also, they are made with simple, whole, healthful ingredients and contain no trans fats, artificial colors, flavors or preservatives. Seeds, grains and beans have outstanding nutritional value, but they are also hard for our bodies to digest in their seed like form. Germinating or Sprouting the seed before using it, helps our bodies to absorb the nutritional value in the seeds and grains rather than it just passing through. Sprouted seeds can provide additional vitamins and minerals than unsprouted ones, making the Way Better Snacks definitely way better! So if I am going to eat healthier, then I would like the food to taste good right? Not a problem with Way Better Snacks!. My entire family enjoyed them, and not a single one of them is a health nut. They are great snack chips to use with salsa and dips, and taste fantastic on their own as well. They are a nice, solid chip that doesn't break when you get a healthy dose of dip on it. Available at numerous retailers throughout the United States and Canada, the limited edition seasonal variety will be available from October 2013 through January 2014. Healthy doesn't have to mean boring! These do sound delicious, and perfect to snack on during the holidays..a bit of festive flavor without a ton of calories. These Way Better chips look so delicious and I like that they are healthy. 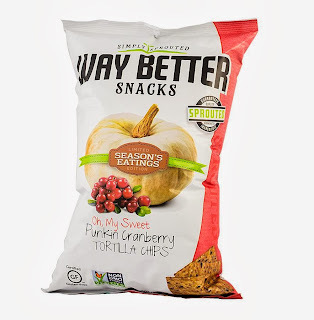 The Pumpkin Cranberry flavor looks so yummy, and this would be a good chip to have with a dip for the Holidays. i get so excited when i find cool new gluten free snacks since i have a friend who is gluten free. Turbo on DVD & Blu-Ray Today!